Located at 135 Nam Ky Khoi Nghia Street. Entry fee about 30000 Dong with the opening hours from morning until late afternoon. One of the must-visit attractions in Ho Chi Minh City is the Reunification Palace. Istaa reunification is also known as Independence Palace. This complex is the first presidential palace of South Vietnam before the fall of Saigon by the North Vietnamese. As a history buff, twice visited the Reunification Palace, tourists will always be creeps. As befits a palace, this place shows various historical artifacts either the original or a replica. A display of tank in the front yard is a replica of North Vietnamese tanks broke into independence Palace gate that marks the northern victory over the South. Development Reunification Palace began in 1868 when the French government to help design and build a residence for the governor of the south. After construction is completed, the site was named Norodom Palace. Between 1887 and 1945, the place is used by French people lived and worked during the invasion of Indochina. In 1945 France lost the battle of Dien Bien Phu and eventually forced to leave Vietnam. At that time, Vietnam was divided into two, namely North and South Vietnam. At that time the South Vietnamese government led by Prime Minister Ngo Dinh Diem. Prime Minister subvert the rule of Emperor Bao Dai and eventually established the Republic of Vietnam with himself as president. Ngo Dinh Diem at this time and his family lived in this complex and he called it the Independent Palace. In 1962, Ngo Diem Dnih began building a new palace at this place, which finally opened officially in 1966. 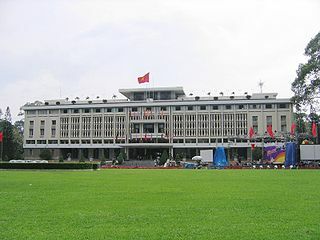 Independence Palace has been a witness to the history of civil war between North and South. During the administration of President Nguyen Van Thieu, Independence Palace became the headquarters of the Saigon government. In 1975, exactly 20 April, a tank with number 843 crashed into a fence up crooked. Tank was followed by tank number 390 is crashing right at the main gate of the Palace. On the same day Lieutenant-Bui Quang Than, leader of 843 tanks, lowering a flag and replacing it with the flag of the National Liberation Front of South Vietnam. That moment marked the completion of the Vietnam War, and the fall of Saigon to the North Vietnamese. Independence Palace architect is Ngo Viet Thu. The architecture of this palace is not haphazard. Ngo Viet Thu mixing modern architecture with oriental architecture, who presented the ancient philosophy and the character of the Vietnamese. In addition to the various rooms are also built based on Chinese characters meaning prosperity, democracy, sovereignty, and so on. The palace consists of five floors. The yard is very spacious with neat green lawns. In front of the palace Vietnamese flags hoisted atop tall poles. The front page of the oval-shaped with a diameter of 102 meters. Lots of travelers who took time to take pictures with a backdrop of the magnificent palace. On the front page there is also a pool reminiscent of a lotus pond usually found in the yard pagoda or temple. The palace complex has an area of 120000 square meters and is situated in between the four crowded highways, namely Nguyen Thi Minh Kai in the northwest, Nam Ky Khoi Ngia in the northeast, Nguyen Du in the southeast, and Huyen Tran Cong Chua in the southwest. The main building forming the letter T with a 4500 meters wide. The main building has 3 floors, 2 mezzanin, terraces, and the basement. Having an entire complex of 95 rooms with their respective functions. Travelers can get into the main building and climbed up to the top floor. The place and the palace is always crowded by tourists, including school children who are conducting a study tour. There are a variety of rooms in this place, among others, the president first room when entertaining guests. Some rooms can only be seen from the outside, tourists are not allowed in. At the top there is a replica of the helicopter that was used when vietnam war. More creepy basement. Especially if by chance you are alone. As experienced on the first visit. In the basement there is a war room, where the first leaders to plan battle tactics. The rooms here also serves as a bunker or shelter homes for the presidential palace when the enemy attacked. In the basement there is also a replica vintage cars, space communications, and so on. In this complex there are also several restaurants and cafes. On the upper floor there are vending. A good idea to also bring drinks around the palace because it is quite exhausting. Be careful with young coconut seller in front of the palace, make sure you ask in advance how much better pay up front. Located at 28 Vo Van Tan Street. The entrance fee is around 15000 Dong and is open every day from morning to evening. The rest of the war museum was originally built just five months after the defeat of South Vietnam. It was named the American War Crimes Museum. But now, the museum has been moved to a more appropriate place. The name of this museum also has long changed following the normalization of bilateral relations with the United States. Based from many tourists, the museum is very interesting with various collections of weapons of war and wartime photos. From the outside the museum has seen only very dancing with a variety of aircraft and helicopters are on display in the front yard. Helicopter UH-1 Huey, or commonly called, an F-5A fighter, a BLU-82 bomb or known by the name Daisy Cutter, as well as the M48 Patton tank on display outside. Various napalm, bombs, grenades, howitzers, and a grenade launcher can also be seen on the outside as well as the ground floor of the main building. Meanwhile inside there are two photographs depicting various atrocities U.S. soldiers. The museum was formerly used as a propaganda tool in place so that there is only evidence of the cruelty of the United States and South Vietnamese army. There is no depiction of the atrocities committed Vietcong. There are a variety of photographs and paintings depicting the victims of Agent Orange, a chemical that is spread by the United States from Vietnam sky. Agent Orange is causing people affected by death or disability, even those who may be new born a few years later could also be affected. One of the most horrible thing in the museum is a large jar containing fetal defects caused by Agent Orange contamination. On the third floor there is a photo exhibition of foreign journalists who had been assigned to cover the Vietnam War. Many of those who have died or disappeared without a trace. On the right side of the main building there is a mock prison cell or a tiger enclosure is a type of cell is very small so that prisoners can only be curled.